When I was approached by sweet Barbara and the thought of me not being forgotten, made me feel so warm and touched. Much memories came back. Similar title but different feel and thoughts. I was given another reason to read what I have written 4 years ago. You can walk down this memory lane with me. I opted for this post to be shared on this special day because each year, this was a day that emotions are especially strong. I reflected on anything and everything, significantly on my achievements and my mistakes. This year was another milestone in life. I have officially graduated from university and landed myself in my dream job in the desired industry. Human relationship was something I treasured and craved for in the past. I love being around people and I was always the one who initiated meet ups or outings. There were much vivid memories of me spending time to have late night chats with friends. I was always nice to people but to the younger me, it would have been fake if I said I did not expect the same back. I recalled, often I felt hurt at people’s decisions of wanting to cut ties. People around me seemed to leave without any tinge of hesitation. Those moments were upsetting and was something that I could not comprehend. I remembered looking for an answer at times but obviously there was not any. As I grew older, things have changed tremendously. It was no longer that easy to meet up with people, talk to people and the late-night chats that I love became lesser and lesser. Denial was something I encountered. I struggled to accept changes which eventually as I grew older, it was something I had to learn to accept. It took me awhile to learn that it is never about the quantity but quality. I questioned the point of having so many acquaintances but during my down times, who will be there to listen to me? I could also easily link it to a concept I used to have. I wanted to live longer if I could, to be a centenarian, to flaunt this achievement of living long. But was I able to tell people at that point of time that I have lived my life to the fullest? In my hesitation, I guess I found my own answer. In my job, people share with me all sort of stories. Some make you feel touched because you feel the sincerity and love one could give to another and that is the purest asset one can have in life. On the other hand, you see the ugliest side of human, the hurt; pain and regrets people have experienced, which shape them to be who they are today. The expectations in society often cause us to forget that we are just humans and mistakes are part of being human. The more we want, the more we chase and when we fall, we sink deep right in. Many times, we forget how to pick ourselves up. It was also at the point of time when I felt, relationship with humans was something I will like to protect. That step to make this decision was not easy, but it was like an open door to me. I felt free. I constantly remind myself to live my life to the fullest each day, so I will not have any regrets if I were going to leave tomorrow. Today, I still stick to my values and principles of always being kind to people, regardless of any differences. I am on my way to do my little part for the society and I am proud of making that small difference. Each of our life, is our awakening journey. Self-realization, acceptance and learning to embrace who you are, are just the parts and parcels of it. We never stop learning and we pay the price of each decisions that we make. My very own journey led me to various paths, allowing me to be a different person than I was before. I strongly believe our insignificant bits made significance to our lives and it is beautiful and perfect just like that. Lastly, to me today, happy birthday. 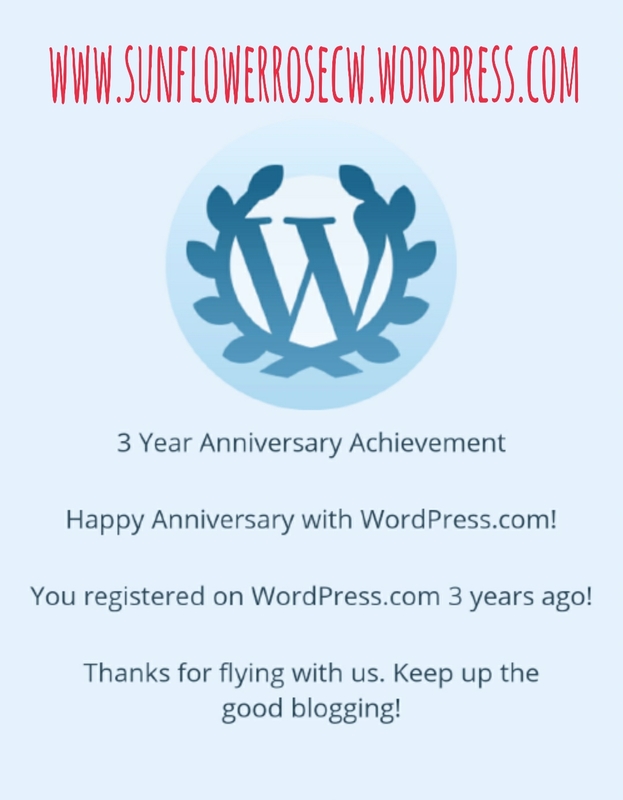 Time flies and is already the third year since I joined wordpress. I can still remember when I first joined WP, it was for fun and I was unaware what was it that I wanted to blog about. It was until my life changing experience that I decided to write to motivate people to keep going and eventually chased my dreams and hobbies of writing poetry and slowly, to where I am right now.